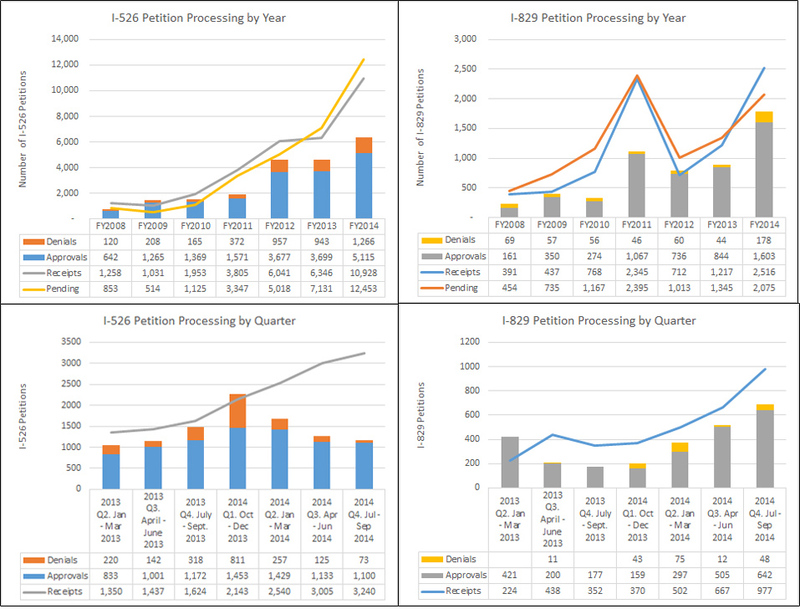 USCIS has updated its Immigration and Citizenship Data page with fourth quarter FY2014 processing statistics for Form I-526 and Form I-829.The numbers show dramatic increases in the number of petitions filed and the number processed. USCIS received twice as many I-829 petitions this year as last, and also processed twice as many. USCIS increased its I-526 processing volume as well, but not enough to keep up with receipts which exceeded 10,000 this year and pushed the volume of pending petitions over 12,000. That soaring line of I-526 receipts is sobering, considering that each represents an investor and only about 10,000 EB-5 visas are available annually for investors plus their spouses and dependents. (The State Department issued 9,228 EB-5 visas in FY2014, and China-born investors face a high probability of EB-5 quota retrogression in 2015.) On the bright side, 1,603 investors removed conditions this year, representing millions of dollars successfully invested and thousands of new jobs successfully verified. The image below shows summary charts from my Excel file of the data, based on files from the USCIS page linked above. Chad Ellsworth of Fragomen, Del Rey, Bernsen & Loewy, LLP has an interesting article Emphasis on Compliance and SEC Interagency Cooperation a Year after the Appointment of Chief Nicholas Colucci to the USCIS Immigrant Investor Program (EB-5). The article summarizes the SEC’s recent EB-5-related activities and describes the content of broad subpoenas issued by the SEC to a number of Regional Centers.